Night time photography of road cruised diamondbacks is getting difficult to make interesting. 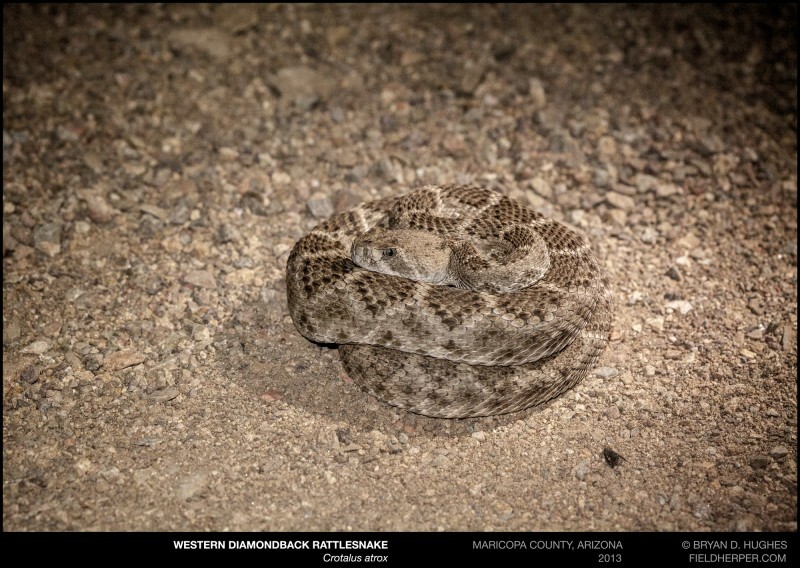 I am always happy to see them of course, but how many hundreds of photos do I really need of diamondbacks sitting in roadside gravel in semi-defensive postures? The answer is, probably hundreds more. This one was at least a little interesting in that the headlights of my vehicle combined with the shallow depth of field kept the natural color of the animal much better than the usual flash trash. Maybe there’s something to this? This entry was posted on Tuesday, June 3rd, 2014 at 10:33 am	and is filed under Field Herping, Photography, Snakes. You can follow any responses to this entry through the RSS 2.0 feed. You can leave a response, or trackback from your own site.